So reads the promotional copy for Ghettopoly, a game that is testing the adage that there’s no such thing as bad publicity. 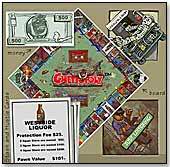 Though the game’s creator, David Chang, claims it was meant as a parody of “urban” stereotypes found in rap and hip-hop music, Ghettopoly has angered many in America’s African American community and lead Hasbro, owner of the original Monopoly name, to file suit for copyright infringement on Oct. 21. Hasbro’s not alone in wanting the game’s sale stopped. Civic leaders across the country, including presidential candidate, Reverend Al Sharpton, have deemed Ghettopoly “racist” and successfully pressured Urban Outfitters, a national retailer of youth-oriented fashions and accessories, to pull the game from its shelves. “Here we are trying to teach 13-year-olds to read, and this is what they are being sold; it is absolutely horrendous,” said Adora Obi Nweze, president of the Florida NAACP in a statement to Bloomberg News. Morris stated that Hasbro was not involved in Yahoo’s decision to shut down Ghettopoly.com on Oct. 13 (“without warning” according to Chang), but the site is currently back online and taking orders, with Chang claiming brisk sales. •What´s in Ned´s Head wins T.O.Y.